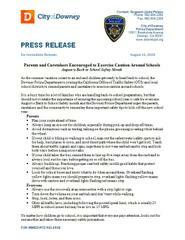 As the summer vacation comes to an end and children get ready to head back to school, the Downey Police Department is joining the California Office of Traffic Safety (OTS) and local school districts to remind parents and caretakers to exercise caution around schools. •	Plan your route ahead of time. •	Always keep an eye out for children, especially during pick-up and drop-off times. •	Avoid distractions such as texting, talking on the phone, grooming or eating while behind the wheel. •	If your child is biking or walking to school, map out the safest route (safety spots to ask for help, best places to cross, and most direct path where the child won’t get lost). Teach them about traffic signals and signs, urge them to not wear earbuds and to stop and look both ways before using crosswalks. •	If your child takes the bus, remind them to line up five steps away from the curb and to always look out for cars before getting on or off the bus. •	Always buckle up. Practicing proper seat belt safety instills good habits that protect yourself and those you love. •	Look for school buses and know what to do when around them. Overhead flashing yellow lights mean you should prepare to stop, overhead lights flashing yellow means drive with caution and overhead lights flashing red means stop. •	Always use the crosswalk at an intersection with a stop light or sign. •	Turn down the volume on your earbuds and don’t text while walking. •	Stop, look, listen, and then cross. •	Obey all traffic laws, including following the posted speed limit, which is usually 25 MPH in school zones but may be as low as 15 MPG.